A simple lemon juice and olive oil dressing melds the flavors of this tossed arugula salad. 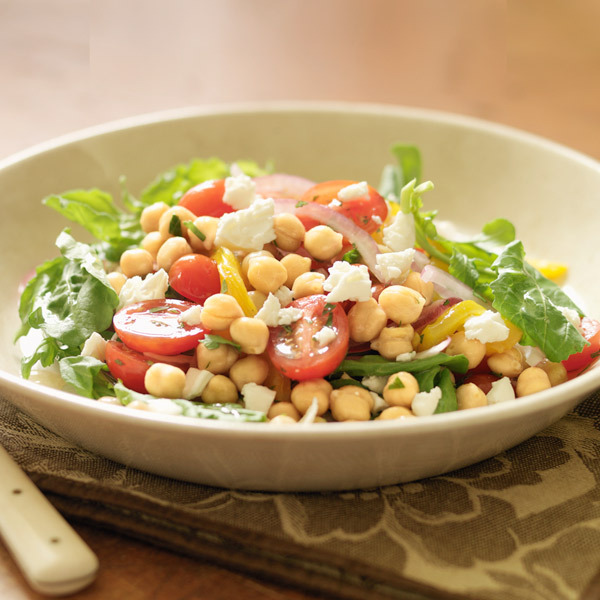 Made with arugula, canned chickpeas, roasted bell peppers, grape tomatoes and red onion topped with feta cheese, the fresh flavors of this easy salad are sure to make it one of your new faves. Preheat broiler. Broil pepper pieces, skin side up, 4 inches from heat for 12 minutes or until skin is charred. When cool enough to handle, peel and cut into ½ inch wide slices. In large bowl, whisk together lemon juice, oil and salt. Add roasted peppers, chickpeas, tomatoes, onion and parsley, and toss to combine. Let stand 30 minutes to develop flavors. Add arugula and toss gently. Serve immediately, with feta sprinkled on top.